Dibz, an online food delivery startup which also serves as an online-to-offline (O2O) platform for discovering restaurant deals, has raised an undisclosed amount in a bridge round of funding from Stellaris Venture Partners and existing investor Benori Ventures, a top company executive told VCCircle. Vikas Bagaria, founder of toilet hygiene brand PeeSafe, and Rahul Maroli, vice-president and business head at ride-hailing unicorn Ola, also participated in this round. Both individuals had invested in Dibz in the past. Apart from Stellaris, the other new investors in this round included Ritu Mehrotra, country manager at Booking.com, and Abhivyakti Gulati, founder of handicrafts & household items platform Aakarsshan. Dibz, operated by Gurugram-based Xpericon Online Solutions Pvt. Ltd, will primarily use the fresh capital to expand to more cities besides consolidating operations in areas where it already has a presence, said co-founder Sonal Pande. Dibz hopes to be present in 10 cities by the end of October. Apart from expanding to a few more cities in Uttar Pradesh, venturing into another state is also on its to-do list. The company had previously raised two rounds of funding - one each in 2016 and 2017 - from Benori Ventures, Bagaria and Maroli besides Amit Parsuramka, president-funds at Lodha Ventures and Partha Sarathi Guha Patra, founder of Asadel Tech. Founded in November 2015, Dibz had a soft launch in April 2016 in Gurugram before moving into tier-2 markets in the region. 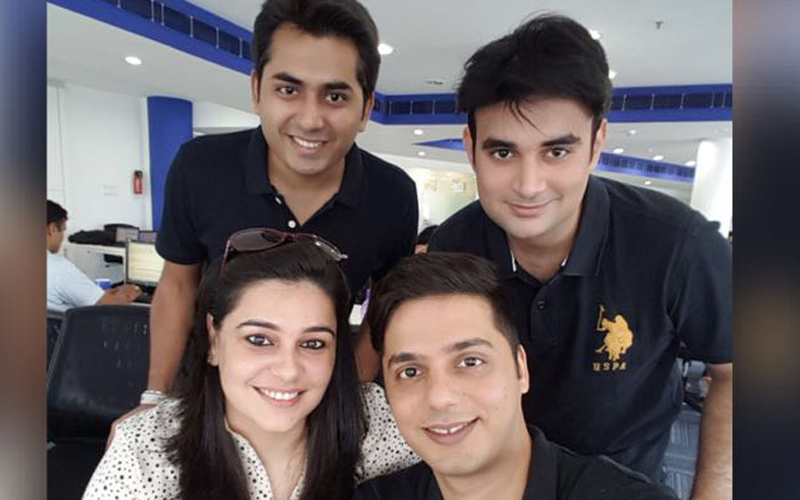 Late last year, Pande’s husband Rishabh Kaila came on board as a co-founder . Dibz’s other founding members include Udit Verma, who looks after verticals that include marketing, operations, customer acquisition and retention. Raunak Pandey handles business development. The venture started off as a mobile app that enables users to discover curated offers and deals from more than 150 restaurants, hotels and pubs. Using proprietary algorithms and a predictive analytics platform, Dibz helps its merchants decide on appropriate deals. However, Dibz has gradually moved away from deal discovery as its primary business and is currently focussing on food delivery. The venture also has plans to develop in-house logistics capabilities. Dibz claims to have more than 70,000 customers using its platform and has plans to increase this number to about 5 lakh by end of this year as it expands to new markets. “The idea is to eventually become a unified platform for food. Be it restaurant deals & discounts, table bookings or home deliveries, we want to be the go-to platform for anything to do with food,” she added. Dibz operates in a food delivery space dominated by Zomato and Swiggy, which have both raised large sums of money this year. Both unicorns offer curated deals as well. In the O2O space, Dibz competes with the likes of Little and Nearbuy, which joined hands last December following a merger orchestrated by digital wallet and e-commerce major Paytm. The duo have a combined market share of 88% and around half of their sales come from food deals. Players in this particular segment have found it difficult to find the right revenue and pricing model, with lack of customer loyalty also complicating matters. However, industry observers feel that macroeconomic factors coupled with the government’s digital push and deeper penetration of smartphones will make the deal discovery space more lucrative, particularly in non-metro cities. Its earlier bets include performance wear startup Bigphi Technologies, mobile business-to-business marketplace Wydr, software-as-a-service platform Whatfix, and mobile-first communication platform for on-field staff Noticeboard. Benori Ventures, which focuses on incubating and investing in startups in India, is led by research major Evalueserve’s former chief operating officer Ashish Gupta. It mostly invests in early-stage startups based in Delhi-NCR. The company focuses on sectors such as education, food, fintech, healthcare and agriculture. The startups in its portfolio include ConveGenius and KleverMind. Earlier this year, it invested more money in health-tech startup Navia Life Care Pvt. Ltd in a bridge round.